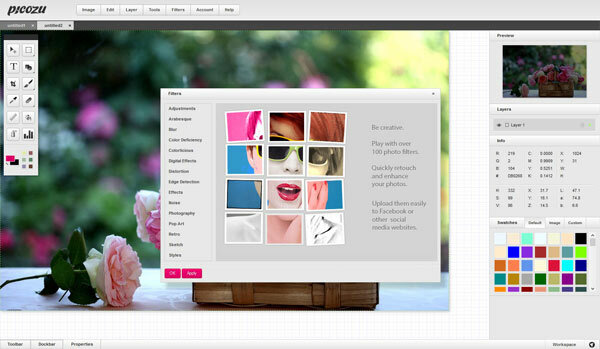 Picozu is a free web application that allows you to edit your photos and images online. It is not even necessary to register to use this photo editing service. Picozu Editor is an online drawing and photo retouching application based on HTML5 and CSS3. Picozu offers dozens of features. For example, you will have access to layers, paint cans, airbrush tool, an eraser and a cropping tool. When you have finished editing your photos, you can apply one of the many filters offered by Picozu. One of the interesting aspects of Picozu is that it allows you to import your photos from your Facebook, Picasa, Dropbox , SkyDrive or Google Drive. In addition, when you create an account with Picozu, you can store your photos directly on Picozu. There are a lot of great things you can do with Picozu Image editor but you can also give double exposure look in just a few easy steps with this Image editor. You need 2 images, blending modes and filters. After giving images a professional touch you can also share them with your friends when you’re done using Picozu’s sharing options. If you are using Firefox then you can easily edit images with Picazu. Cause the website has their Firefox extension available for download. Picozu Shooter is a Mozilla Firefox browser extension, which allows you to take a screenshot of a given browser page, or a specific region of it and save it to a file, clipboard or Picozu Image Editor. So guys, give Picozu a try and share your views with us via comments below.